Welcome to the first issue of MicrobeHunter magazine. You can download the PDF and order a printed version. The February issue will be released around Jan 20, 2011. Congratulations for this excellent magazine for amateur microscopist. Thank you for sharing your work with all of us. I love your project. Great job! Thanks a lot! Yet again, I would like to encourage everyone to contribute articles and pictures (send them to me via email). Thank you for filling a large gap in the amateur microscopy world. Other than Miscape there is little to interest those of us who are not scientifically trained in microscopy but love looking through the scope at whatever tickles our fancy. 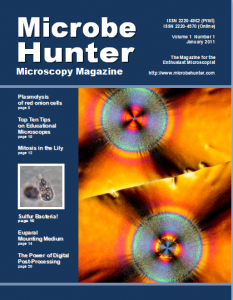 Congratulations on the first edition of Microbe Hunter magazine. It is of professional quality and I look forward to seeing and reading many more issues. I hope I can contribute something to the magazine in the near future. >I hope I can contribute something to the magazine in the near future. I’m happy for all contributions to make the project sustainable. What you are offering to us all is the opportunity to leave our own impression upon the world we inhabit.The object and obstacle of our common passion is the need to connect broadly with those who share our passion.We are not greedy.We are not conceited.We all are deeply interested in our world and what goes on in it.Microscopy is a consuming hobby or an act of consummation-us with our world.Whatever possesses us to take up this noble quest is a matter of consequence to us and the broader public.We all improve the condition of the world at large by the individual efforts we make as individuals to explain it.All efforts,small and large,are effectors to this end. My love and will and passion to all who read this,and may 2011 be the year we are blessed with the realization of this project.This is a place where we can all be heard. I am managing director of an educational aids products import & sale company. Your magazine is really a wonderful and fascinating informative publication.it is a new year gift for life science students and teachers at ALL levels. I am going to recommend it to my customers. Hear, hear to Greg and H.Shokouhi comments of encouragement. Students of many levels can enjoy Olivers microscopy world view platform. Students can have their microscopy projects, their lab reports entered in this forum for all of us to benefit from. Thank you for developing such an essential and informative website which I am sure had help a lot lf student including myself. I am doing an Anantomy & Phsyiology course, I did a lab today and it was all about the history, function, types and used of the mircoscope. I intern used your site to source my information however i want to write my reference page but i can. Is it possible for you to give me a proper refernce in the APA style for your site so that i can put it on my Lab Report which us due on Wednesday at 3:30 pm. Kim, O. (2011, September). The World of Sponge Spicules. Microbehunter Microscopy Magazine, Vol 1, Issue 9. 18-19. The make sure, that you insert the correct name of the author in the magazine. Not all articles were written by myself. I recommend http://www.bibme.com to make bibliographies.